Ithaca 37 is an unusual design because both John Browning and John Pedersen, normally competitors, contributed to its design. It both feeds and ejects from the bottom, making it friendly to right and left handed shooters. An older home defense model shown. 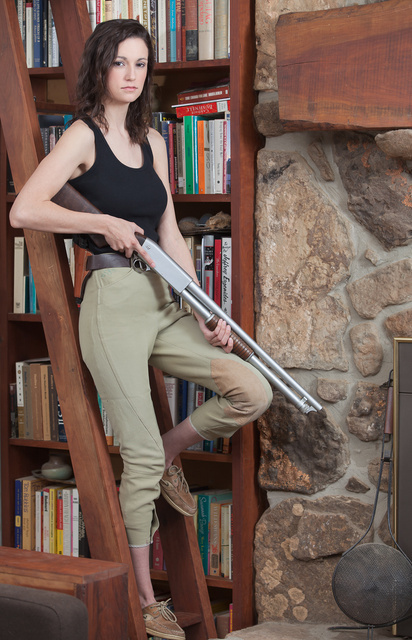 This entry was posted in book, self-defense, shotgun, weapon and tagged 12ga, pump shotgun. Bookmark the permalink. I have Model 37 Featherweights in both 16 and 20 gauges. Great guns. However, I’ve never seen one in what appears to be stainless with an extended tube. I wouldn’t mind finding one! It’s an older gun and I suspect the chrome is aftermarket. It’s a 1970’s model police riot gun variant or the Ithaca M-37 which were mostly available in a parked finish. I did see one once with a blued finish as well, but never a nickeled finish. The 20″extended magazine variant saw a lot of use during the Vietnam War. A very light weight 12 gauge pump SG that kicked like a young mule. It would also fire every time you pumped the slide if you didn’t release the trigger first. I owned a parked finish riot gun variant as well as a 12 gauge bird gun. Now I’m content with 870’s and Mossy’s. Doesn’t look a day over 19, if you ask me. The Ithaca riot was made in factory chrome in the 1970’s.